The new Dell Precision workstation line bring a robust design, scalability and adaptability for our OEM customers in Industrial Automation, Healthcare, Control rooms, CCTV, Simulation and Defense. 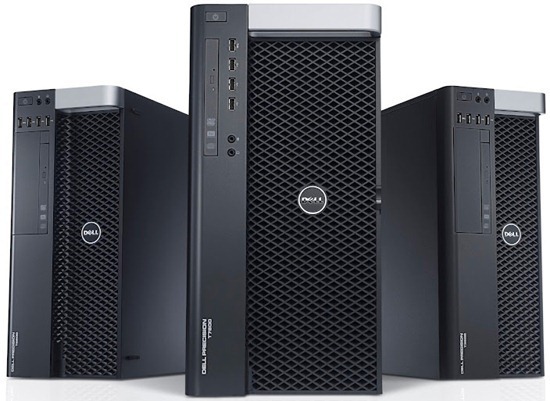 Extensive field research combined with invaluable OEM customer testing and feedback drove the development of the new tower series including the T1650, T3600, T5600, and T7600, which add to the very successful Dell Precision R5500 rack workstation and Dell Precision M46000 and M6600 mobile workstations. Lionel recently blogged about how competitive the new Precision tower systems are, and I agree with him. 1. Dell OEM Solutions has created an Extended Life (XL) program for the Dell Precision T3600, T5600 and R5500. The XL program provides OEMs with longer product life cycles (+12 months over a commercial roadmap) with predictable and planned system changes and transitions. That ensures peace of mind for OEMs that need to conduct extensive transition planning and re-certification of their applications. 2. Dell’s Precision enhanced solution stack (software and services) ensures that OEMs get to access Dell’s extensive range of End User Computing solutions. Dell OEM Solutions also provides the capability to support your operation backed with its global presence of services. OEMs currently considering their business operation model with the backdrop of increased demands for robust security with encryption, remote manageability, or wanting to explore options of utilizing cloud computing or client virtualization will be interested in this. So lets cover a few of the new industrial design features of the Dell Precision tower workstation portfolio range that are designed to support OEMs. First, the new Dell Precision workstations offer the new Intel microarchitecture and eight core CPUs for multi-threaded applications; generation three PCIe I/O support for improved visualization performance with next generation graphics; and up to 512GB quad channel memory for running large data sets in memory. The new workstations offer NVIDIA Maximus technology, which enables simultaneous visualization and rendering or simulation, and also feature a broad range of professional-class graphics cards from AMD and NVIDIA including up to an AMD FirePro V7900 and NVIDIA Quadro 6000. Externally you will notice the new industrial design (picture) is completely functional from a handling point of view and easy accessibility. The new efficient chassis design on the T7600 provides one of the only front accessible quick release hard drives on a tower workstation. Designed for our OEM customers in data intensive fields like video editing who need to swap out hard drives easily and military and research organizations who need to store sensitive data in a secure location at the end of the day, it comes with up to four 3.5-inch hard drives or eight 2.5-inch hard drives. 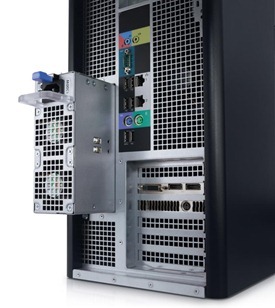 Externally Removable Power Supply – Dell is offering the industry’s only tool-less externally removable power supply on a mainstream tower workstation. The power supply is lockable and has a built-in handle that lights up green when functioning properly which decreases downtime spent detecting and servicing issues. Remote Access – The Dell Precision T7600 easily converts to a rack solution, which can be mounted to any standard Dell PowerEdge server rack. By centrally locating the workstations, businesses can help maintain a clean and quiet work environment, keep hardware safe and give remote workers access via a Dell Precision FX100 zero client. Reliable Memory Technology – Another industry first is Reliable Memory Technology (RMT), a Dell patented code programmed at the BIOS level that eliminates virtually all memory errors on high-end workstations. RMT extends the capability of ECC memory by detecting the location of the corrected memory error and prevents the system from writing to that spot again following a reboot. Available on the T3600, T5600 and T7600, RMT increases the reliability of the workstations and eliminates the need for extensive full memory tests, IT support calls and memory DIMM replacement. Whatever way you look at it, the new Dell Precision workstation line is a game changer. We look forward to hearing your feedback on the new systems. Contact myself via e-mail or through Dell OEM Solutions online.